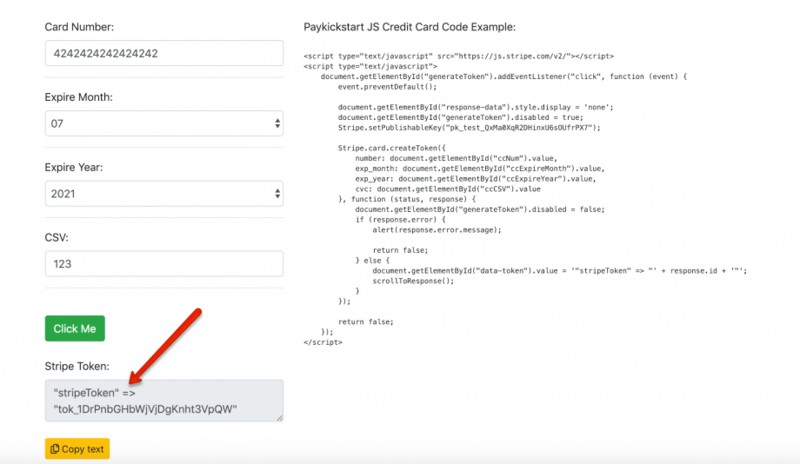 PayKickstart’s New Purchase API call is a highly flexible system designed to allow you as the vendor complete flexibility in terms of creating and managing new purchases. Using the API, you’re able to override your products’ default price settings, or even create a new charge without needing a client’s credit card information (reference transaction). The form field element ID which is responsible for capturing the customer’s credit card number. The form field element ID where the PayPal button will be rendered into. Using the generated token, you can submit an API call (see below) to process the transaction. 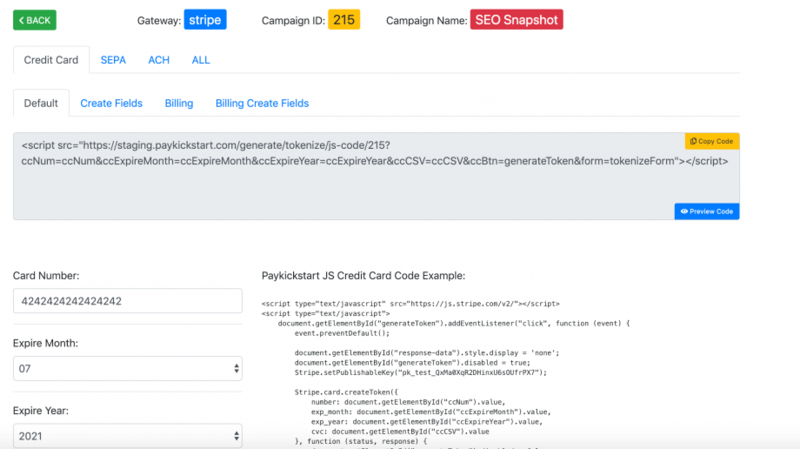 The Paykickstart vendor’s API Key. This field is required. The campaign’s id. This field is required. The product’s id. This field is required. The paykickstart affiliate id for the affiliate which should be credited (and/or receive commission) for the purchase. The commission settings from the campaign / product / affiliate overrides will be used to calculate the commission owed. The buyer’s first name. This field is required. The buyer’s last name. This field is required. The buyer’s email address. This field is required. Instead of providing the buyer’s PayPal or credit card information via token to create the purchase, you can pass the invoice_id you receive via the IPN post as the ref_purchase. This will cause the system to use the payment profile already stored in Paykickstart and associated to that original purchase to create the new purchase. This field is not required, provided that a token is submitted instead. Create this purchase using Paykickstart’s native “test mode” ability. This field is not required. Override the product’s price amount for this purchase. If this field is not set, the price from the product’s settings is used. Override to charge the product as a “split pay”. This field is not required unless you are setting total_installments and price_per_installment. The price per split pay installment. This field is required when split_pay_selected is set, and must also be LESS that the product’s main price. The number of recurring_freq_type E.g. recurring_frequency of 2 and a recurring_freq_type of months, means the subscription will charge every 2 months. This field is required when is_recurring is set. This field is required when is_recurring is set. The number of payments for your subscription. Set as null for an infinite subscription. This field is required when is_recurring is set. Enable trial period for the purchase. Please note this is only currently possible for recurring subscription products. This field is not required unless you which to create a trial period for your product. The initial amount to charge for the trial. Amount may be set to 0 for free trial. This field is not required unless you have has_trial enabled. The number of days before the subscription transactions begin. For example, if you want to set a 14 day free trial, make sure the product is set to recurring in its settings or via the API, then set trial_amount to 0 and trial_days to 14. This field is not required unless you have has_trial enabled. Option to toggle whether or not you want to capture the buyer’s billing address. This field is not required. Option to toggle whether or not you want to capture the buyer’s shipping address. This field is not required. Boolean (accepts 0 or 1 as values). Indicates that the user has accepted your terms of service. Required if Terms of Service option is enabled in the product’s settings. The last 4 digits of the customer’s credit card number. The 4-digit expiry year of the customer’s credit card. The 2-digit expiry month of the customer’s credit card. Pass as many custom fields you like through to the purchase api. Replace <FIELDNAME> with the field name of your choice. This field is not required. The token generated by Stripe JS on your checkout page when accepting Credit Card data. 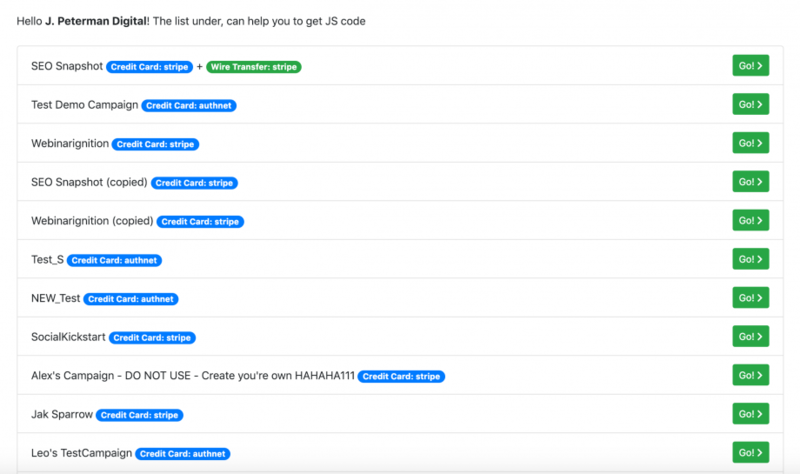 The source generated by Stripe JS on your checkout page when accepting bank details. The Baintree token created by BraintreeJS when accepting Credit Card purchases using Braintree. The authorization token created returned from PayPal / BT PayPal.